See if you can catch Sara Cockrell. 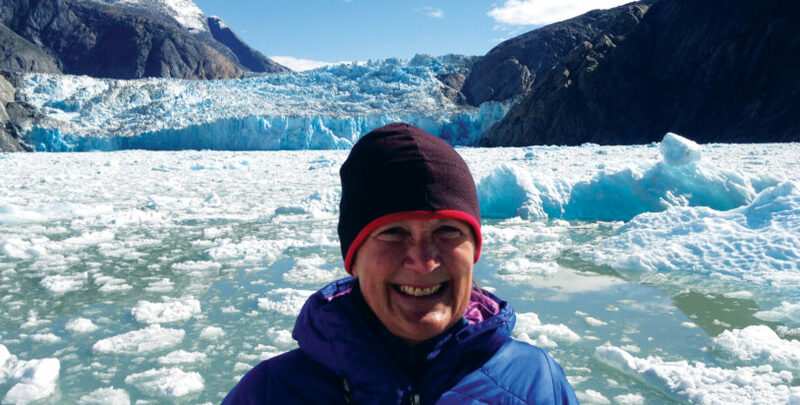 When she’s not hiking, biking or paddling at one of her favorite spots with friends in Northern Michigan, she’s likely traveling the world—hiking in Iceland, backcountry skiing in Colorado, or trekking along famous Western trails, to name just a few of her adventures. Despite her frenzied schedule, Cockrell, a cancer survivor, concedes she wasn’t always so athletic. She grew up in Dallas where she occasionally waterskied or rode horses. Sometimes there was downhill skiing in Colorado. Married for a short time, she and her husband moved to Traverse City in 1986, where they ran a small business. For a long stretch, she jumped into the world of racing in cross-country skiing, mountain biking, and paddling, mostly in Northern Michigan. She’s done all the big races, including the Iceman Cometh Challenge, a well-known 30-mile mountain bike race from Kalkaska to Traverse City, and the Au Sable River Canoe Marathon, an annual 120-mile canoe race from Grayling to Oscoda. She never finished the latter, and although disappointed, she has no plans to make another attempt. Today, although she is not as fit as during her racing days, she’s in good health. She eats right and gets plenty of sleep. Her life remains active, with a calendar stuffed with outdoor activities. The rewards for being outdoors, she says, are innumerable. Find out Sara’s favorite spots for outdoor adventures in Northern Michigan.